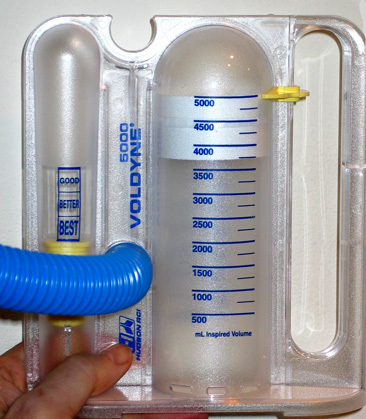 "Vital Capacity (VC)" is the maximum volume of air that one can exchange in a single breath. "Tidal Volume (TV)" is the amount of air that one breathes unconsciously. In adults, Vital Capacity varies between 2.5 and 5 liters, increasing with height, decreasing with advanced age, and increasing with pulmonary health and overall fitness. Low VC is correlated with disability in chronic respiratory disease, and with obesity. Low TV is correlated with depression, chronic fatigue and reduced longevity. By definition, one's Tidal Volume can only be increased up to one's Vital Capacity. Both VC and TV can be increased by breathing exercises. Heart Rhythm Meditation increases both Vital Capacity and one's typical Tidal Volume by practicing a full breath of several liters. This picture shows a Heart Rhythm Meditator easily topping the Vital Capacity instrument at 5 liters. 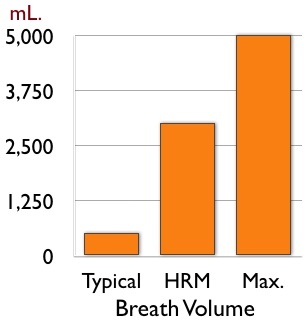 This chart shows the relative volumes of the Tidal Volume (typical unconscious breath), compared to the volume of the breath used in Heart Rhythm Meditation, which is roughly half of the Vital Capacity. We are interested in increasing the volume of breath because breath is spirit and we want more spirit in our life. Exchanging breath is our main interaction with the world. The more we breathe, the more engaged we are with the life around us. We are especially interested in reaching toward the bottom of our breath because this is analogous to an exploration of the unconscious, like going underwater. We can easily expand the volume of our breath by just breathing out more than usual. When we do that, we will also breathe in more than usual. Therefore, in Heart Rhythm Meditation, we increase our breath volume by trying to complete the exhalation.